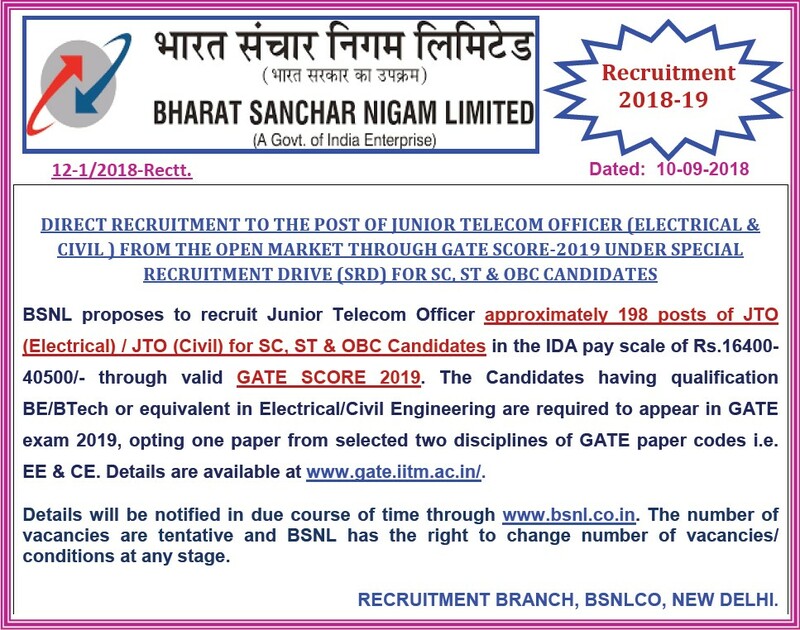 -- Recruitment of "Graduate Engineer" to the post of Junior Telecom Officer (Civil & Electrical) from the Open Market through GATE Score-2019 under Special Recruitment Drive (SRD) for SC, ST & OBC candidates. -- Advertisement inviting application for the post of Chairman and Managing Director, Bharat Sanchar Nigam Limited (BSNL). -- CORRIGENDUM for recruitment of Executive Directors under the "Procedure for appointment to the grade of Executive Directors (ED) in BSNL through immediate absorption basis". Procedure for appointment to the grade of Executive Directors (ED) in BSNL through immediate absorption basis. -- Appointment of Senior Administrative Grade [SAG] & NFU in SAG of organized Finance & Accounts services officers of Central Government in Bharat Sanchar Nigam Limited (BSNL) on deputation basis.